These pumpkin designs showcase some scary creativity. Love it or hate it, Halloween is well and truly here. It's the time of year where thousands of young 'uns (and not-so-young 'uns) dress up as their favourite scary character and pumpkins adorn homes across the world. But not all pumpkin carvings are created equal – and these examples of creative pumpkin designs have truly blown our minds. While there may be a new Pennywise in town these days, Ben Angotti (and friends Maniac Pumpkin Carvers) decided to pay homage to the original nightmare clown, played by Tim Curry. The design you can see here is entirely carved from pumpkin, lit with an LED bulb – no paint or markers. More cute than terrifying, this Halloween version of Star Wars' BB-8 is an impressive effort by imgur user Magnetic Attitude. It was created by stacking a little pumpkin on top of a bigger one, and lit with two light sources plus some flashing LEDs. Bonus points for creating a design that works from all angles, too. Head to imgur to see a 360-degree view of this masterpiece, plus GIFs of it in action. This pumpkin carving comes from Villafane Studios, a group of specialist sculptors that makes incredible sculptures from pumpkins, sand, and other materials. This scary smiler is part of the Enchanted Pumpkin Garden exhibition that the studio puts on each Halloween. Want to make a bold design statement this Halloween? 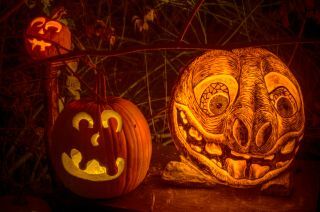 You could do worse than to be inspired by the Maniac Pumpkin Carvers, aka Brooklyn-based artists Marc Evan and Chris Soria (which helped create the Pennywise design at the top of this article). Maniac Pumpkin Carvers is a full creative art studio that specialises in elaborate pumpkin art, and have clients including Honda, Yahoo, and the BBC. The full glory of a pumpkin design is never quite realised until a candle is placed inside. This is certainly the case for this haunted castle design, with its intricate carvings of windows, bats and an almost 3D feel. The huge moon in the background really makes this one. We know we're cheating a little here, as this bored looking face wasn't actually carved from a pumpkin. It was etched into a squash and was created by Ray Villafane and his Villafane Studios team (which also created the Smiler design, at number 3). Come on - you didn't expect us to include just one of his designs?! This creepy ET design is part of the Jack-O-Lantern Spectacular, hosted annually by Passion for Pumpkins. "Basically, what we put on here is an illuminated art show set to music,” explains founder John Reckner. The event begun as a small, family-run show, but has exploded in popularity – the event has been attended by over a million patrons to date. Check out further masterpieces in its online gallery. A beautifully crafted animal creation with this pumpkin design. We can't get over the amazing attention to detail with this one – from the carefully placed wrinkles to the wholly realistic eyes. Notice the 3D aspect of the trunk too. There are plenty of superhero pumpkin designs out there, but we have to say that this crawling Spider-Man impressed us the most. Looking like he's crawling from the top of the pumpkin, the attention to detail with his web-like costume makes this a winner at Creative Bloq. Another television show-inspired pumpkin design is this awesome Game of Thrones opening credit creation. The pattern work with this one must have taken a bucket load of patience, with the carefully etched wolf silhouettes proving wholly inspirational.